The first hull of Custom Line’s new planing line, Custom Line 120, built for an American owner and designed by Francesco Paszkowski Design, has recently been launched and will be debuted in the US in early 2018. The new sporty and luxurious Custom Line 120’ a jewel in the Custom Line planing fleet and the first to carry the signature of Francesco Paszkowski Design, was launched at the Ferretti Group shipyard in La Spelaunczia. 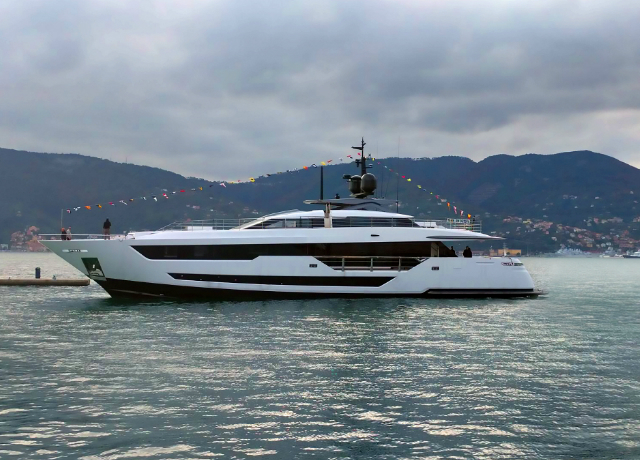 The technical launch took place in the presence of Ferretti Group CEO Alberto Galassi, the Group’s Senior Management and the Custom Line Engineering and Sales teams. Attending the event as the owner’s representatives were the yacht’s captain and Jason Wood, the US broker through whom the sale was made. The official delivery is due at the end of 2017 Afterwards Custom Line 120 will head for the United States – a hugely successful market for the brand and the owner’s native land – for its memorable world première event in Florida. The new yacht will then make Miami its base, where it will sail between Florida and the Caribbean and will also provide a charter service. 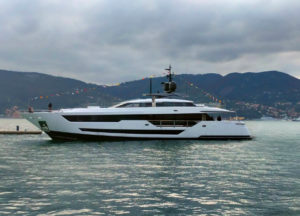 The product of a joint effort between the design studio of Milan-based architect Francesco Paszkowski and the Ferretti Group’s Product Strategy Committee and Engineering Department, Custom Line 120’ marks a major turning point in the development of the brand’s planing fleet and is set to become the icon of a new era for Custom Line. The yacht combines traditional stylistic features of boating with elements and characteristics that are typical of automotive design and civil architecture. A very thorough research on contemporary trends has also enhanced forms and volumes through furnishing choices in line with a state-of-the-art interior design. A new feature is the hull’s construction process, created through infusion moulding. These structures are built and assembled as a sandwich to provide maximum solidity and lightness, which are enhanced by the skilful use of carbon fibre. The design of the cockpit is striking for its contemporary look, thanks to a large, innovative window subdivided into two sections which swing open separately to create a versatile area that can be used to lengthen the cockpit and extend the lounge. On the upper deck, the comfort of a flybridge and the sportiness of a coupé blend admirably in a panoramic deck with an aerodynamic design to be enjoyed in total privacy, a perfect setting offering owner and guests a luxurious relaxation area complete with jacuzzi. Custom Line 120 is equipped with twin MTU 16V 2,000 M94 engines, generating 2638 mhp, reaching a cruising speed of 22 knots and a top speed of 25 knots (preliminary specifications). As with all other Custom Line projects, all internal furnishings have been customised to suit the owner’s wishes. The second Custom Line 120 is currently under construction at the La Spezia production facility, while the hull of the third yacht will be transferred to the Liguria site in January 2018.